Tonight at Russki Gorki Ski Jumping Center, high above the Black Sea in the Caucasus Mountains, 30 women jumped for joy and into the Olympic history books. 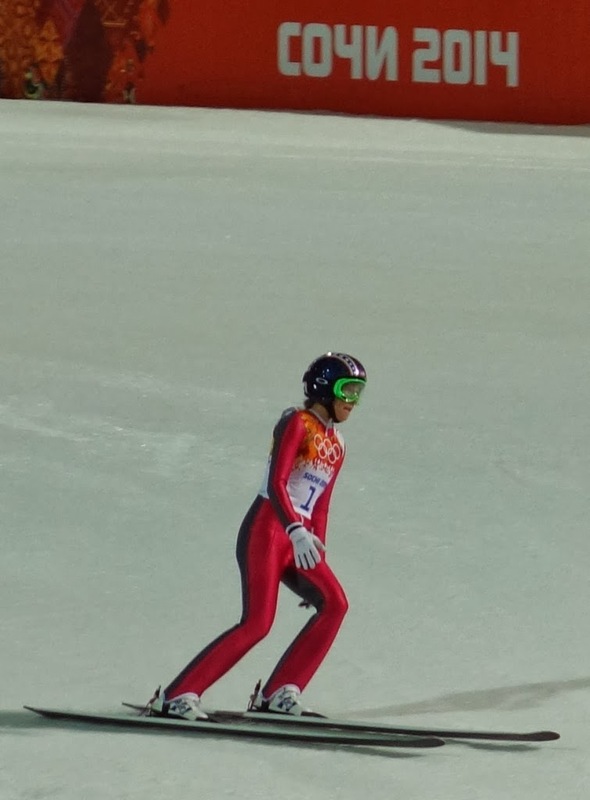 Following years of failed attempts to gain five-ringed status, women's ski jump at last debuted at Sochi. The evening included many surprises. On my first trek to the Mountain Cluster of venues, the train ride from Sochi was quiet but a bit longer than anticipated (90 minutes). It was surprising to discover my seat-mates, a Sochi-born grandmother-mother duo heading to meet grandchildren at the venue, have family in Dallas, and we've both eaten steaks in the same Fort Worth restaurant. Until arriving, I had no idea Russki Gorki's train station connected to a towering gondola lift. The ride up was smooth though not for the faint of heart. Making new friends or crossing paths with Games-time colleagues was another enjoyable surprise. Even the venue dining (I ordered a crepe with ham and cheese sold as a "pancake with meat") was tasty. 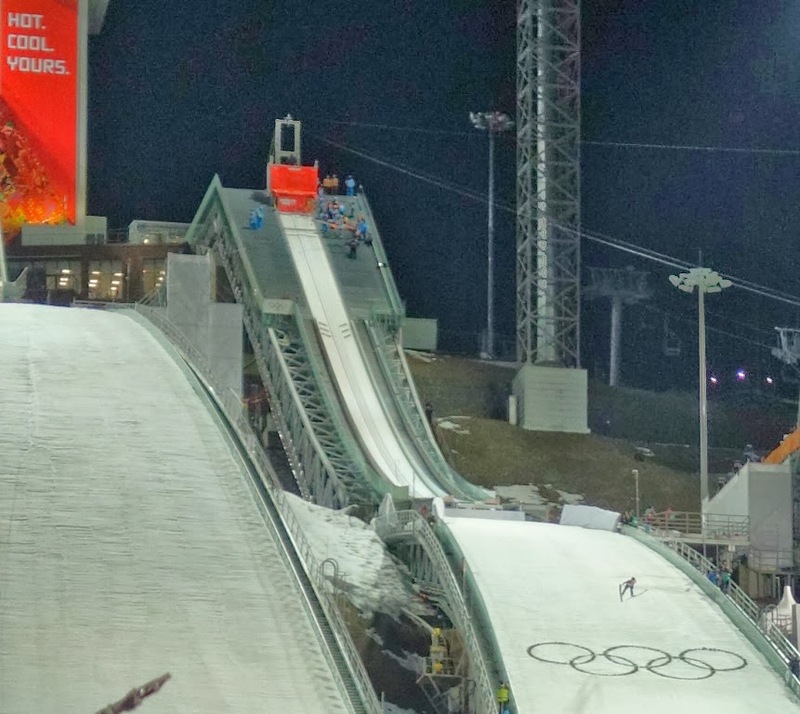 Though Sochi is my fourth Winter Games, this was my first experience at ski jump unless you count watching reruns of Roger Moore's chase scene in "For Your Eyes Only." Tonight's event ticket was the first Sochi event for which I purchased access, based on Team USA's outstanding record in the sport. There were some fellow-Americans on site to cheer on Sarah Hendrickson, Lindsey Van and Jessica Jerome, and after meeting all three of these brave young women during the Team USA Media Summit last October, cheering their daring feats -- launching themselves dozens of feet off the side of a mountain at great speed -- felt a bit more personal. It surprised me neither Van Halen nor Kriss-Kross music played to warm up the crowd who danced to other tunes, as much for fun as to keep warm (we were, after all, in the Russian Rockies). Though disappointed that Team USA's trio did not make the medal stand this time, when the top three jumpers' results emerged, I instantaneously thought "next time" and it won't surprise me to find Hendrickson, Jerome and Van in competition now through 2018 and beyond. 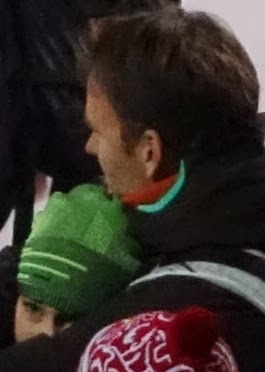 As the winners completed their final jumps, I spotted Hendrickson, already partially changed out of her jumping gear, in the "family access" area embracing her boyfriend and wiping away tears of acceptance that this was just not her night. After months of recovery from injury, odds were not in her favor. The surprise gold medalist and her reaction to her final score brought the second-to-last surprise du jour. When Germany's victor slid into the waiting area for the judges marks, and they flashed her winning result, the jumper fell to her knees crying with joy and disbelief. 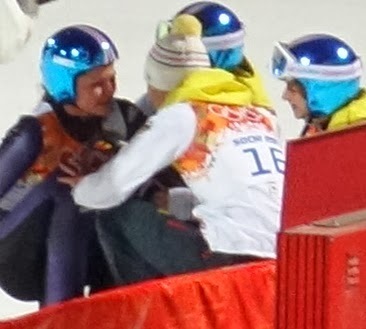 It took three teammates to help her stand again for the cheering crowd. I had not seen such candid gold medal emotion since some of the slow-motion reactions captured in Bud Greenspan's series "16 Days of Glory." Bravo to the winner and all of the medalists and athletes! 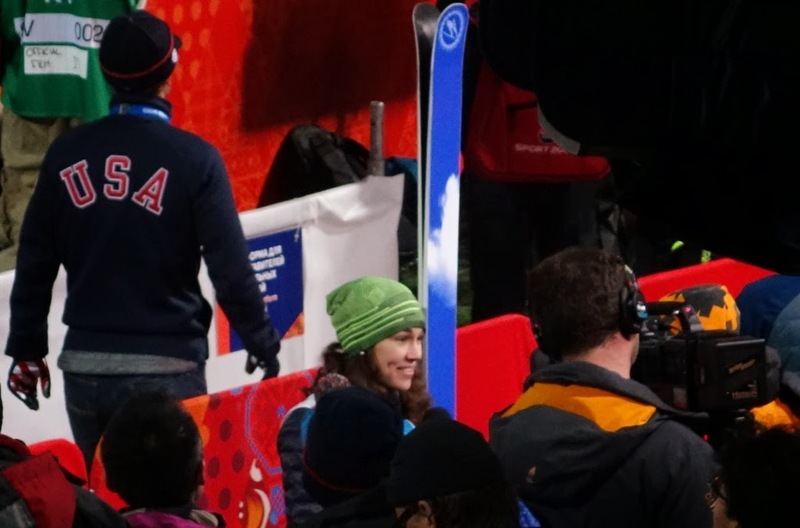 Moments later, as Hendrickson made her way down media row for the inevitable questions about "what happened?," it was good to see her smiling again with misty but not tear-filled eyes, perhaps a sign she is already thinking of the possibilities for victory in Korea in four years. Here's hoping she and all of tonight's competitors may again be jumping for joy and history in 2018.